Portable spectrum analysis once meant a handle and sacrifice in measurement power compared to a larger benchtop or rack-mount spectrum analyzer. 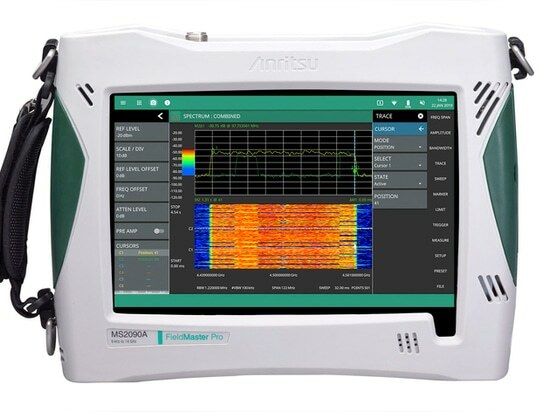 With the new Field Master Pro portable spectrum analyzer from Anritsu Co., there’s no sacrifice. These portable model Field Master Pro MS2090A instruments put real measurement power in the palm of the hand—in seven frequency configurations from 9 kHz to 54 GHz. The individual models cover frequency spans of 9 kHz to 9 GHz, 9 kHz to 14 GHz, 9 kHz to 20 GHz, 9 kHz to 26 GHz, 9 kHz to 32 GHz, 9 kHz to 44 GHz, and 9 kHz to 54 GHz. Those selecting one of the lower-frequency models can always send it back to the Anritsu factory (Morgan Hill, Calif.) for an upgrade to a higher frequency range. These versatile spectrum analyzers leverage the latest analog and digital device technologies to provide wideband measurement capabilities that were possible only in a much larger rack-mount instrument. Depending on the measurement function, they provide at least 2 h of running time (and typically 3 h) on a rechargeable battery that fits within that handheld spectrum analyzer. Even with their small sizes, the Field Master Pro MS2090A portable spectrum analyzers (Fig. 1) don’t skimp on features. For instance, the display screen is a 10.1-in. diagonal color touchscreen with 1280- × 800-pixel resolution. It offers adjustable brightness (Fig. 2) that makes it readily visible in bright sunlight and darkest night. The display screen has a “finger-swipe” function for simplicity, allowing users to swipe and scan across a trace to look for hard-to-find signals within a wide frequency range, or pinch on part of the screen to activate close-up views of signals of interest. 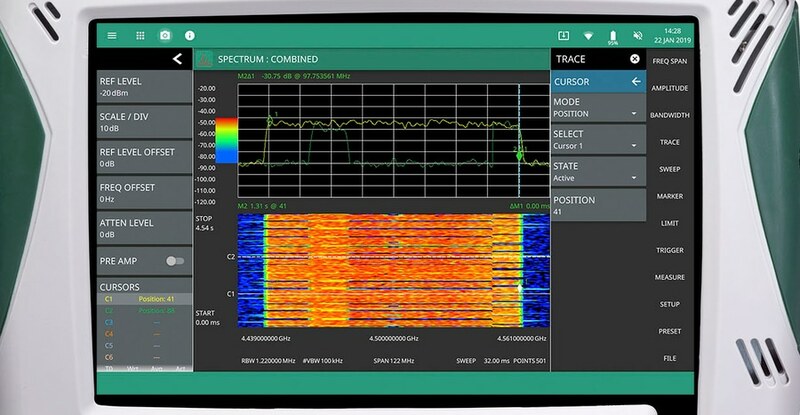 The operating software menus for the Field Master Pro portable spectrum analyzers have been created and tested to follow industry standards for touchscreens and provide optimum user effectiveness. Operating modes and functions can be changed in less than five seconds to facilitate many different measurements in the field. As many as six separate traces can be shown on the display screen, with as many as 12 markers at one time. In addition, limit lines can be set for pass/fail readings. The display is protected by a rugged screen guard that can take the treatment of in-field testing; as evidence, the color touchscreen exceeds IK08 standards for lighting products for impact protection. Even connector ports are protected by rubber over-molds to ensure low loss and high measurement power in challenging operating environments. Behind that screen is some of the industry’s most comprehensive signal-analysis measurement power. It’s capable of a real-time spectrum-analysis bandwidth as wide as 100 MHz that, on the widest-bandwidth model, can be tuned anywhere within 9 kHz to 54 GHz. This type of portable measurement power supports many present and future test applications, including broadcast, defense, radar, satellite communications (satcom), and the inevitable 5G cellular wireless communications systems, both in the laboratory and in the field. In terms of signal capture and display capabilities, these analyzers extend the limits for both large and small signals. The instruments all achieve a displayed average noise level (DANL) of better than −160 dBm with third-order intercept (TOI) of typically +20 dBm and phase noise of typically −110 dBc/Hz offset 100 kHz from the carrier. Regardless of captured signal power, the instruments maintain typical amplitude accuracy within ±0.5 dB. The portable spectrum analyzers have been designed with at least one major emerging wireless application in mind: testing the various signal components of the next version of cellular radio technology—5G New Radio (5G NR) wireless systems. Because of the steady consumption of radio bandwidth by wireless radio systems over the years, testing of 5G NR systems calls for an extremely broadband measurement system, including frequency bands at 3.5 GHz and in the millimeter-wave region at 28 and 39 GHz. These analyzers handle tasks such as electromagnetic compliance testing, cell identification (ID) testing, beam ID testing, and measurements of spectral emission masks. On top of that, they feature enough instantaneous bandwidth for quickly locating harmonic and spurious signals and potential interference from other radio sources that will fall within the spectral region of 5G NR systems. The Field Master Pro MS2090A analyzers combine hardware measurement power with software control to bring laboratory-like precision to the field. Their wide dynamic ranges and Spectrogram displays help simplify spectrum monitoring in the field, especially for spurious or occasional interference signals. Limit lines can be easily set for captured signals, to show such things as pass/fail signal levels. 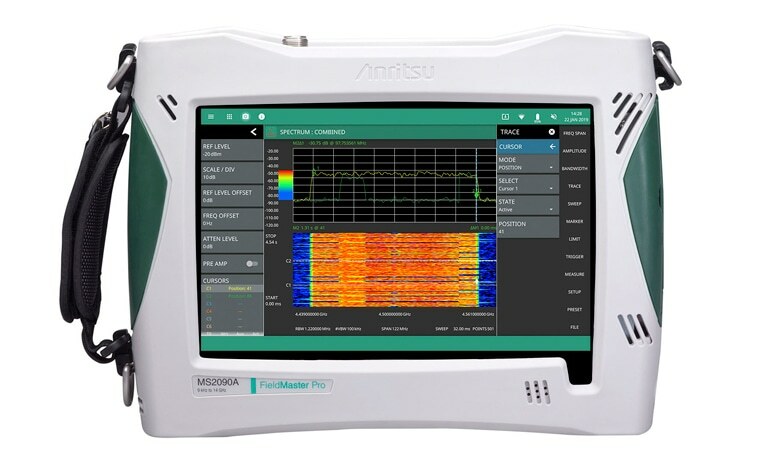 As one application example, the wide capture bandwidth of these compact analyzers can be integrated with Anritsu’s NEON MA8100A Signal Mapper software to make a 3D in-building map of signal coverage or a display of outdoor wide-area radio coverage by combining data captured with the MS2090A and the graphical display capabilities of the MA8100A software. 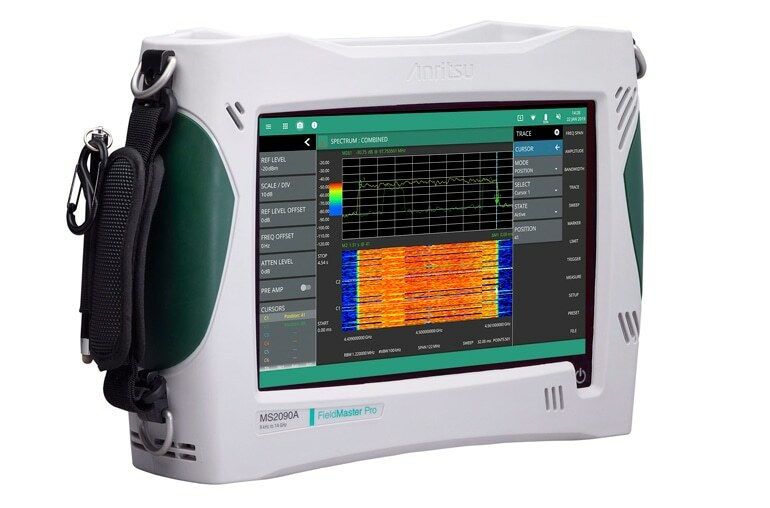 In fact, the Field Master Pro MS2090A series includes a variety of automatic measurements to simplify in-field testing, including integrated channel power, occupied bandwidth (OBW) and adjacent-channel-power (ACP) measurements to simplify wireless communications system conformance testing. Of course, 5G NR represents just one (albeit very large) future international wireless communications application. Motor vehicles will soon present another large application, both inside and outside the vehicles, as will everything plugged into the Internet of Things (IoT). In addition to motor vehicles using radio waves to communicate to each other as part of the “smart highways” of the future, they will offer short-range radio waves, such as Bluetooth and wireless local area networks (WLANs) within each vehicle. As a result, passengers will be able to communicate with each other as part of what may eventually become a mobile WLAN, which will require the portability and the versatility of the Field Master Pro spectrum analyzers for on-site testing. Global Navigation Satellite System (GLONASS). 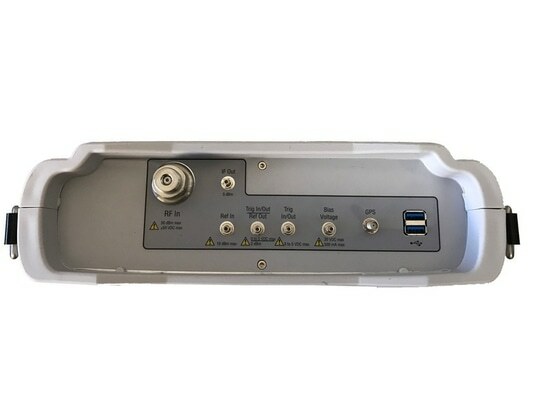 Since more and more motor vehicles now include Universal Serial Bus (USB) connectors, the Field Master Pro spectrum analyzers also include USB 3.0 connectors as well as PCIe and Ethernet wired connections for physical interconnections to different equipment and instruments (Fig. 3). For those who remember the portable spectrum analyzers of years past, with their reliable measurement power but those large housings and blue handles, these spectrum analyzers are a fraction of the size and have considerably more measurement bandwidth. And that amazing 10.1-in. 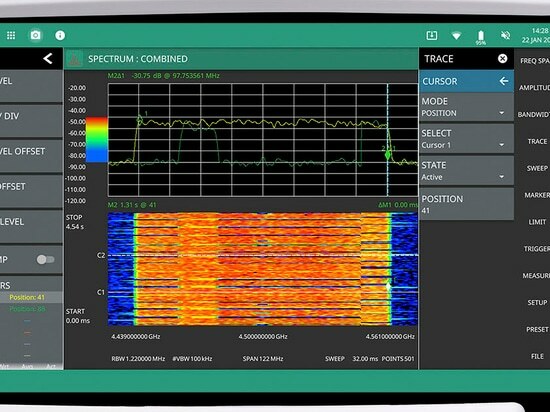 diagonal screen helps take the tedium out of high-frequency spectrum analysis. With its assortment of interconnecting ports, including USB 3.0, these little spectrum analyzers could even conceivably take on a USB test signal source in the field as part of a little “pocket-sized” test system that goes where needed. Plus, if 5G and vehicular wireless systems are any evidence, those test systems will be needed in the field. 1. Compact Field Master Pro MS2090A portable spectrum analyzers include a vivid 10.1-in. diagonal color touchscreen display with 1280- × 800-pixel resolution. 2. 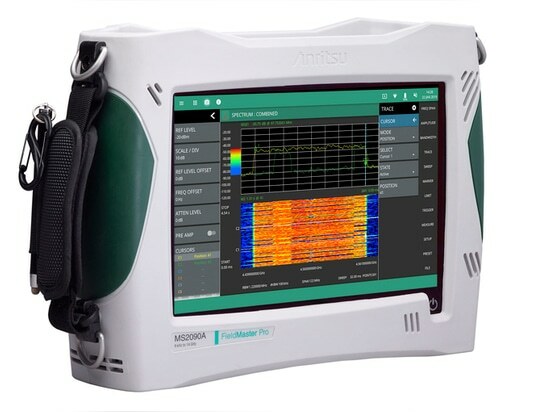 The large size of the display screen relative to the compact housing makes the Field Master Pro MS2090A spectrum analyzer a powerful field measurement tool. 3. The intelligent design of the Field Master Pro MS2090A analyzers includes top-mounted connectors, protected by a recessed cavity.